We have created poster versions of the Realm of Tal’Dorei Map found in the Tal’Dorei Campaign Setting book. Available in framed, canvas-printed, and unframed versions, this gorgeous map by award-winning cartographer Andy Law makes a wonderful gift for the Critter in your life, and it will look great on your own wall. Through December 4th, 2018, 50% of our profits from these maps will go to the California Community Foundation’s Wildfire Relief Fund. Additionally, we’ve placed the print and PDF versions of the Tal’Dorei Campaign Setting on sale at 20% off in our Green Ronin Online Store, and 20% of the proceeds of that book and PDF in our Wildfire Relief Fund Sale will go to the same charity. 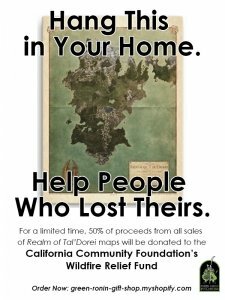 Please join us in supporting wildfire survivors in California, and get a beautiful map of Tal’Dorei while you’re at it.